Hello Lovelies! This week - a word of warning I will be bombarding you with Lush reviews (along with other posts) as I completely forgot that Mother's Day was so soon! So I have a bit of a backlog of reviews, whoops... but that means if you're a Lush fan you will love my blog this week. For today's review, we have the Rose Bombshell Bath Bomb (£3.95), which is actually a remake of one from last year but looks completely different. I can't complain though, as I think the new design is absolutely gorgeous with its neon green and pink touches. Scent wise as you'd expect, it has a lovely rose scent - my favourite! My only bug bear with this bath bomb is that it easily leaves bits of pink and green everywhere, so definitely one to be careful with when picking it up. When you drop this into your bath, it quickly dissolves into an explosion of pink eventually spurting out a few rose petals. What I thought was really pretty about this one though was the pretty white residue (I think it's oil?) 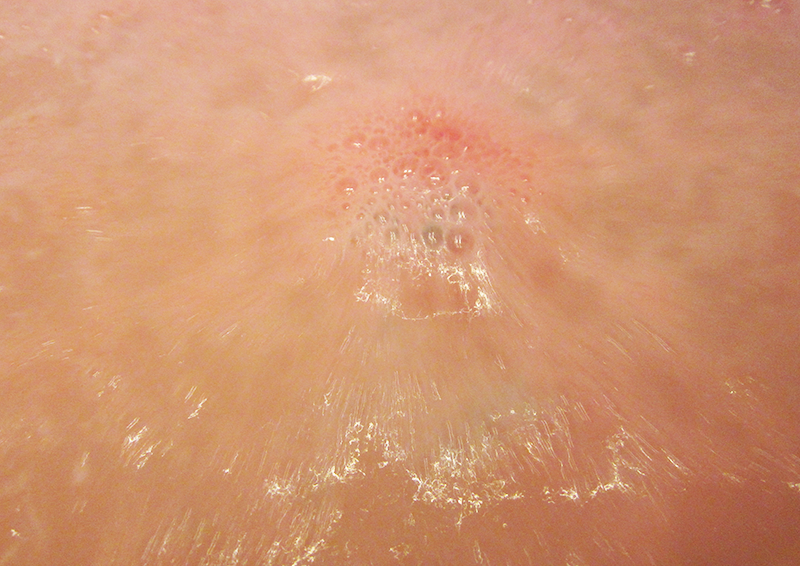 that lies on top of the bath water, which gives the bath this lovely feminine look. The water was also lovely and moisturising, and just smelled lovely. Like honestly if you love rose, you will be obsessed with this. All in all I'm a bit in love with Rose Bombshell. It isn't the most stunning bath bomb ever in the bath, but lovers of rose will be in heaven with this one. It's pretty, moisturising and just gorgeous. My only reservation is that this one can stain the bath but don't worry this just requires a bit of cleaning afterwards - it won't actually stain! Thank you for reading lovelies! Look out for more Lush reviews this week, they will be coming in abundance! I love Rose Bombshell it's one of my favourite bath bombs, I have to admit though I do prefer last years design. You just reminded me that I have another Lush bath bomb waiting to be used! Eek! Been some months I wonder if it's still any good?! This looks beautiful. Wish I had seen them earlier so I could stock up.